Tim Winter / Abdal Hakim Murad is lecturer in Islamic Studies at the University of Cambridge, and is dean of the Cambridge Muslim College, UK, which trains imams for British mosques. In 2010 he was voted Britain’s most influential Muslim thinker by Jordan’s Royal Islamic Strategic Studies Centre. His most recent book is Commentary on the Eleventh Contentions (2012). Abdal Hakim Murad regularly leads Juma prayers at the Cambridge central mosque, and has preached in major mosques in Australia, Singapore, Malaysia, Spain, and the United States. Recordings of his khutbas and lectures are widely available in Islamic bookshops. His articles have appeared in The Independent, the London Evening Standard, the Daily Telegraph, The Times, the Catholic Herald, Islamica, Zaman, Neue Zrcher Zeitung and Prospect. He is also a regular contributor to BBC Radio 4s Thought for the Day. Sincere thanks to Tim Winter / Abdal Hakim Murad for this interview. Musa Askari : What does the term “spiritual” or “spirituality” invoke within you? Despite various manifestations of spirituality in the world do you sense at the heart of “spirituality” itself some common ground where people of different faiths or none may encounter each other? Do you recognise such a thing as “trans-spiritual”? Abdal Hakim Murad: The meaning of the category of the ‘spiritual’ has been so heavily debased by vague New Age appropriations that, although I have sometimes used it myself as a kind of shorthand, I usually find it useless. So many people tell me that they are ‘spiritual but not religious’; but have nothing to say when asked what this means, other than offering a woolly, half-finished sentence which indicates that they have experienced an emotional high in certain situations. If we try to use the term more exactly, we may find that the use of the word to indicate the action of the spirit – either God’s or our own – breaks down when we admit, as most religions do, that everything in existence is in fact the operation of the spirit. Again, the word typically leads us to confusion. It’s probably better to be Platonic, and speak in terms not of ‘spirituality’ but of beauty, which is ‘the splendour of the Truth’ – wherever beauty is discerned, the spirit is engaging in authentic perception, intuiting, whether we admit it or not, that beauty in the world is the sign of the sacred. That includes beautiful conduct, as well as physical or aural beauty. This would bring us closer to the semantic range of the Islamic word ihsan. On that kind of category we can of course speak of the possibility of forms of mutual recognition between adherents of outwardly very disparate paths. No sacred tradition has ever marginalized beauty. On a rudimentary level we agree that modernity has replaced beauty with a love of newness and originality; and our leaders normally lament this as a disaster. That is a significant, although rather negative, basis for unity and mutual comprehension. More subtly, it is interesting how the recognition of beauty in, say, music or architecture, very often leaps over formal religious boundaries. Buddhists can feel transformed in cathedrals; and American Catholics admit that they are moved when they visit the Taj Mahal; and so on. Musa Askari: At times I have, innerly – intuitively, been moved to tears by either reading aloud or remembering the beautiful verse in The Quran, “We are of God and unto God we return” (sura 2: ayat 156) At some inner level something is stirred within the soul (a memory perhaps) and those tears are as gifts, the after effects, powerful but secondary. The primary effect is with the soul, our non-material, invisible, indivisible companion, catching a glimpse of the coat tails of this beautiful verse on “returning” and following it. I recall Hasan Askari sharing the metaphor of a child at play upon hearing the voices of it’s parents calling, leaves the play and rushes to greet them. It is perhaps in that swing from the heart to soul we move from the outer meaning to the inner meaning, from the manifest to the hidden. From the particular to the universal, from multiplicity to unity. I found it moving and a deeply spiritual statement where in your 2010 interview with The Independent you referred to your conversion to Islam as, “the feeling of conversion is not that one has migrated but that one has come home”. I would be grateful if you could share more about the feeling of “coming home” and perhaps consider relating it to the verse quoted above on returning to God or any other verse you feel relevant? Abdal Hakim Murad: To enter Islam is to repeat the Shahada (the Testimony of Unity and Prophecy); and the Shahada is really nothing less than a testimony to our Source which is also our native land: our point of origin and our place of return (mabda’ wa-ma’ad). The five canonical Prayers are an enactment of this: the shahada during the prayer, said facing the House, affirms the House’s representation of the eternity of God, and also our remembering of the Primordial Covenant. In that sense the Prayer is ‘the pillar of Islam.’ It is our formal act of love and obeisance, and our highest dhikr – recollection of the Beloved. ‘Give us peace, Bilal’, the Holy Prophet would say when he wanted the Call to Prayer to be heard; and he said ‘the coolness of my eye is in prayer.’ The Hajj is a different kind of reenactment, taking the form of a symbolic journey from the periphery to the centre. Like the Prayer, it recalls the Ascension of the Holy Prophet, in which he left his earthly city for the Heavenly Abode. It is that Abode which is, as the Qur’an reminds us, our ‘refuge’ (ma’wa), and our Abode of Peace (dar al-salam). The Garden is our home; but we can experience an intoxicating breath of its fragrance on earth, if we love and recognize the Gardener, and love and care for His garden and its other guests. The only true disaster for us in this place of wonders and signs is to look around us, and allow the demon within to say: ‘There is no gardener; this is only energy and matter’. From that expression of the ego’s defiance, all sin, without exception, flows. Put differently, it is also the true source of our alienation. In a sense the lover of God is always at home, because he feels around him the traces of his Beloved, on all side, in every moment. Love is to be at home, as well as to long for it. This is why the true Qur’anic believer follows the counsel of the Holy Prophet: ‘wherever he finds wisdom, the believer has the most right to it.’ He knows that although outward adherence is essential; inward adherence may recognize value and beauty in the most unexpected places and people. Wherever the Beloved is yearned for sincerely; the believer will be respectful, for Beauty and sincerity are always to be honoured. This is the meaning of Sufi ‘tolerance’ – it is not a political or doctrinal category – for God’s Law is always to be revered; it is an acknowledgement, rooted both in scripture and in our social experience, of the reality of inward transformation in people of other traditions. I believe that your father, rooted in the ancient and nuanced sapiential world of Hyderabadi mysticism, made that the basis of his interreligious work. One starts not with the One, but with the Many – for that is where we find ourselves and in the context of which we build our relationships. Great Muslim cities – and in the days of the Nizams, and for some time thereafter, Hyderabad was certainly one of the greatest – maintained a cosmopolitanism that sat easily with inward sagacity, an urbane and literate courtesy, and also with a passion for the outward resources of Islam. Your father was a product of that world, a representative of a classical Islamic deepness and certainty which is fast disappearing today. The young, although desperately in need of an awareness of the sanctity of religious others, often have no idea it ever existed. In today’s multicultural world, fundamentalism and xenophobia seem to be replacing humility, empathy, and the courage to learn from others. Perhaps this is the greatest tragedy of our times. At times our calling upon God is not a shared experience. It is not as communities or as collective identities that at times we turn to the Almighty for guidance but in the company of solitude. As a muslim leaves their shoes outside upon entering the mosque so too one perhaps leaves at the threshold of the inner door – one’s inner sanctuary, collective associations (not abandoning them). It can be an experience or “moment” of utter helplessness, of being completely alone with oneself as slowly the “presence” of silence fills the room like a beautiful “fragrance” and there leaps forth from our heart and soul a “calling” upon God. Can you please talk about what forms the “calling upon God” take within Islamic tradition? From the formal prayer (salat) to spontaneous heartfelt utterances? Also in your opinion to what extent does “silence” play a role in the spiritual life of Islam? 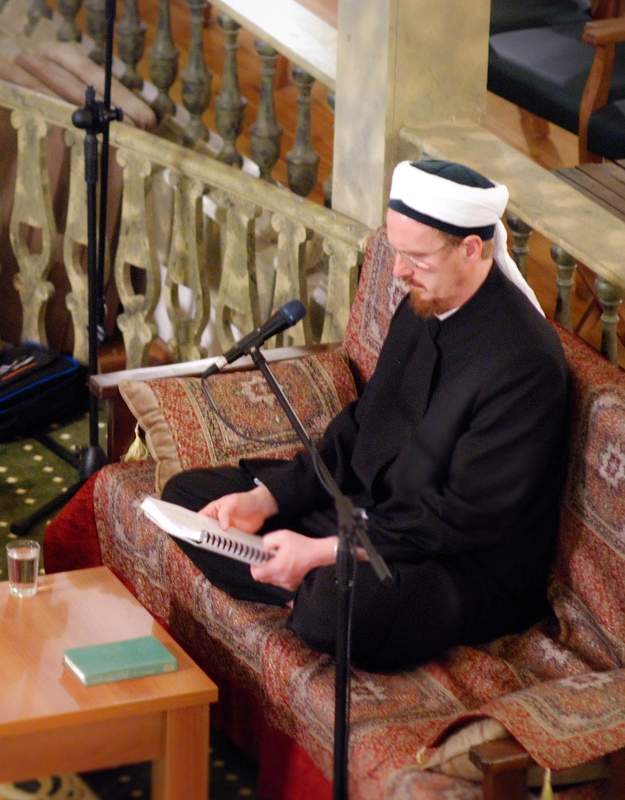 Abdal Hakim Murad: I often reflect, as I listen to sermons, that the virtue of silence is not sufficiently cultivated among my contemporary brothers in faith. Or, I might venture to add, among my sisters. Imam al-Ghazali, borrowing from Ibn Abi Dunya’s book of homilies, The Book of Silence (Kitab al-Samt), sums up very finely the Islamic teaching here. As always, a middle course is required. On the one hand, Almighty God, in whose image we are called to remake ourselves, speaks, and has done so often! Who can count the number of His words and scriptures? ‘Were the sea to be ink for the words of my Lord, the sea, and the like thereof, would run dry’. And His prophets, and most of His saints, speak. But their words are wisdom, springing from the Divine self-communication, Speech, Logos – which is from the Essence and is ultimately something so pure it was can be seen as uncreated, partaking in the Divine pre-existence (azaliyya). Abdal Hakim Murad: The Qur’an celebrates human diversity; indeed, it is unusual among monotheistic scriptures in doing so. Significantly, it does not include the Tower of Babel story. The ‘difference of your languages and colours’ is a sign of God. In this, the text, in its original distant Arabian cradle, is anticipating its gigantic global reach. More than any other premodern sacred culture, Islam embraced a diversity of worlds. Vincent Monteil, the late professor of Arabic at the Sorbonne, and a committed Muslim and Sufi, wrote of the ‘five colours of Islam’, in a volume which was a tour de force of scholarship, dealing with the Islam of Africa, the Middle East, the Turkic world, the Perso-Indic world, and the Malay nusantara. In all these places a diversity of humanity has sought the shade of the Holy Prophet’s tree, and all those cultures burst into fruit and flowers when Islam reached them. Religious diversity, however, is not necessarily part of this; because the Qur’an is also insistent on the absolute importance of truth. The God it describes, with the 99 Beautiful Names, is not just another possible account of an Ineffable Noumenon, it is a true God, and those Names describe Him truly. Hence the law of non-contradiction ensures that different religions, which insist on different accounts of deity, cannot simultaneously be true. To claim that their discourses should be regarded as purely relative, is to denigrate them. Humans have the right to expect that their beliefs will be taken seriously on their own terms, rather than just seen as a set of picturesque metaphors which help our inward transformation. Where do you see opportunities for non-ideological co-operation/dialogue between secular humanists and people of faith not only in terms of human rights but also on re-examining issues relating to our origins as human and spiritual beings as the above quote from Hasan Askari attempts to do? Abdal Hakim Murad: Well, there are several questions here. One is the frequently overbegged question of whether ‘human rights’ should be understood through the lens of one culture alone. We speak of ‘universal human rights’ when in reality the rights concerned, for instance in the various generally impressive UN declarations, are those which were acceptable to Western or Westernised intellectuals in a particular historical period. John Gray’s Straw Dogs contains an amusing and rather shattering discussion of this. In fact, the author of the Universal Declaration of Human Rights was a Lebanese Catholic intellectual who founded the Phalangist militia which massacred thousands of Palestinian civilians at Sabra and Chatila in 1982. And recently we have seen how most Americans have failed to protest against torture, black sites, special rendition, and state surveillance of civilians, as part of the ‘War on Terror’. In practice, the authors of these declarations promptly set them aside when it suits them to do so. There may be a disturbing and deep cause for this. It seems to me that one of the weak points of the modern discourse is the disjuncture between ‘humanism’, with its often lofty ideas about the human capacity for altruism and nobility, and the hard Darwinian paradigm of the ‘selfish gene’, which holds that we are the consequence of a billion years of blind selfishness. Hitler was a much more consistent Darwinian than are liberal democrats. This unpleasant truth about the implications of strict materialism has not been honestly faced. The question of the emergence of Islam as an abrupt paradigm shift in history has attracted much attention. It is hard to find another historical event which changed so much so swiftly. Thanks to the profound love and fellowship among the Companions, a new human type seemed to be created overnight, and great civilizations quickly followed. This does, I think, challenge mechanical understandings of the human species as being reducible ultimately to the ‘selfish gene’ and natural selection over immense periods of time. We have the right to be a little Hegelian here: there are ‘world-historical individuals’ through whom astonishing things are accomplished. Hence Carlyle’s inclusion of the Holy Prophet as perhaps the most salient chapter of his book Heroes and Hero-worship. As Hans Küng has written: ‘Muhammad is discontinuity in person’. Here, more than in any other historical event, we find a challenge to evolutionary reductionism; I think your father was being very wise here. Science is steadily turning into scientism: a rampant total Theory of Everything, which increasingly either patronises or demonises religion. Believers, whatever their tradition, should help scientists to recognize that a true humanism will be alert to ultimately irreducible, personal, aesthetic and ethical dimensions of human consciousness, and will resist, to its dying breath, the reduction of the sons and daughters of Adam to ‘meat machines’.